There was no wandering today. The sub- zero conditions persuaded me as ride leader to drive to Hornbeam from Knaresborough with bike in tow. What a mistake! The journey took longer by motor than my usual 30 minute ride. As I belatedly arrived the lonely two cyclists who had turned up were on their way home, as was James who had been on hand to let any other optimists know that the rides were off. Driving back over Forest Moor, I passed a number of hardy EG’s on route for the 10.00 start from Low Bridge. No stopping those boys. 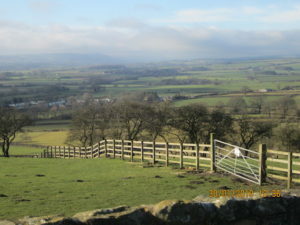 Disappointing on such a beautiful day to have missed a ride, but we have a route ready to look forward to next month. Kevin sent a ‘WhatsApp’ message at 7.30 asking what the group were doing as it looked unsuitable for cycling. Thirty seven messages later a decision was made. This is what happens when Gia is away! Some lovely locations were suggested for a walk by Alan but we opted for a walk which didn’t involve using a car. 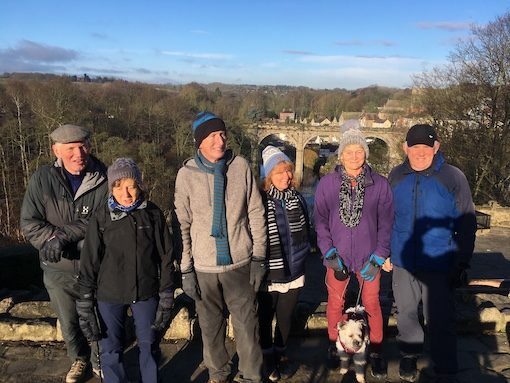 Seven of us and Rodney the dog eventually met up at Knaresborough bus station for a walk around the town and along Waterside and Abbey Road. We were all impressed with the coffee and cakes at Stanley’s Coffee House and Kitchen in Barker & Stonehouse on St. James’s Retail Park. The fact that the waitress was from Sunderland made it even better, for me at least! After coffee we headed to town and caught the bus back to Harrogate. An enjoyable morning in good company. 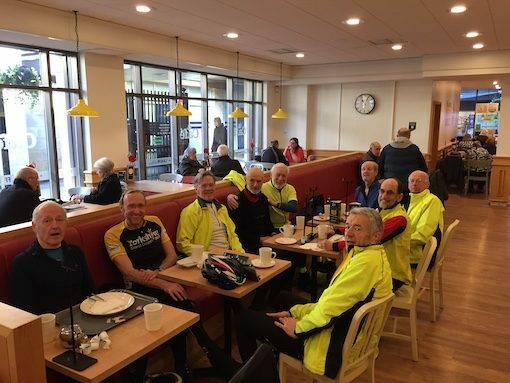 Dave S, Geoff, Eric, Dave P2, Pete B, Dave P1, Norman, Bill, and Chris (me) gathered at Low Bridge some determined not to miss out on a ride this week having decided discretion was the better part of valour last week and then reading about the 100km ride! The route was discussed and various options considered, the decision postponed. We would ride to Wetherby and decide the route there but whatever we decided we would be using treated roads. Dave W was met before the end of the riverside road the surface of which showed that treated roads was the sensible option. The icy patches by the river negotiated the band broke up naturally and we regrouped at Morries. As Eric organised the seating we settled and someone mentioned the B word. Brexit discussions can be difficult (it seems to me) but Eric came to the rescue and gave an account of his latest medical issue, patient confidentiality prevents me from going into further detail. I am not sure if we got to the conclusion of Eric’s story but Dave S and Dave P2 described misadventures on the grass track and I was able to name drop (Beryl Burton once shook my hand after a 25 mile time trial). We lingered as Norman handed out the link for the Kirkpatrick-Macmillan-cycle-rally clickhere before deciding it was time to move on. Any disagreements over the B word were put where they belong, with hand shakes, have a safe journeys and such like. The main (largest) group comprising Daves W, P2 and S, Chris, Geoff and Eric headed south. We got as far as the Boston Spa round-a-bout (not very far) when some confusion over the route occurred. 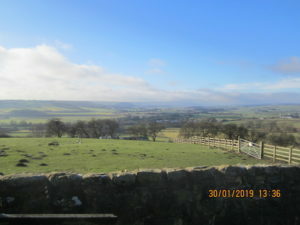 Dave W was encouraged to keep to the more main roads and we headed towards Aberford but before we got there Dave W decided that he would head off and parted company. A stop at Lotherton Hall had been considered but it was much too soon so Tadcaster was the next objective where it was hoped we might meet Dave W.
The day was truly lovely, the inviting view east towards the Vale of York bathed in winter sunshine combined with the fresh air made it feel good to be alive and on a bike. Unfortunately there was no sign of Dave W at the Lemon Tree where, after much consideration of which table we should sit at, we stayed where we were and tucked into just about every combination of toast, baked beans and eggs. Rested, refreshed and revitalised we headed towards the Askhams and a loop home. The wisdom of riding on treated roads came home as we encountered ice and mud but no one came unstuck and we emerged at Askham Richard via Catterton and Bilbrough. There is a genuine feeling of comradeship within this band of codgers and a desire to be inclusive (you don’t have to be Elderly or a Gentleman to join the EG’s) and I think this and the fractures in the group during the day were the catalysts for the decision to try to be more organised and make better use of the hours of sunlight in future. It was agreed that we consider if a 9:30 start would be possible and that we would try to publish ride routes which took into account the different needs and wants of all involved. This would be put to the officers of W.E. to make sure it was done in the best interest of all. As the sun sank lower the temperature dropped noticeably. Taking turns into the breeze we stuck together and followed the familiar route. Still in sunshine our Eric said farewell when we reached the B6164 and the remains of the band broke up in Knaresborough. What a lovely day. Using treated roads for most of the day we had covered the best part of 50 miles with a band whose connection is sharing the joy of pushing the foot rests round. Chris B. Just a few obvious statements.